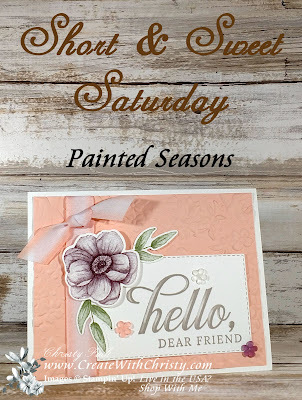 It's been awhile, but I finally have a Short & Sweet Saturday card for you. Once again, I'm using the Painted Seasons Stamp Set from the Sale-A-Bration, Painted Seasons Bundle. 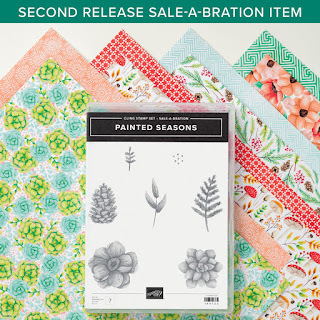 The bundle includes the stamp set and Painted Seasons Designer Series Paper (DSP). 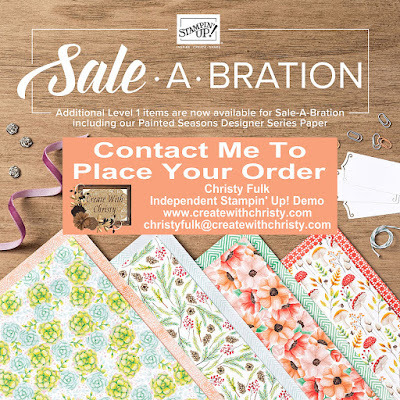 Until March 31, 2019, or while supplies last, you can get this bundle FREE with a $100 order (before shipping & tax). As you can see, I didn't use the DSP this time around. 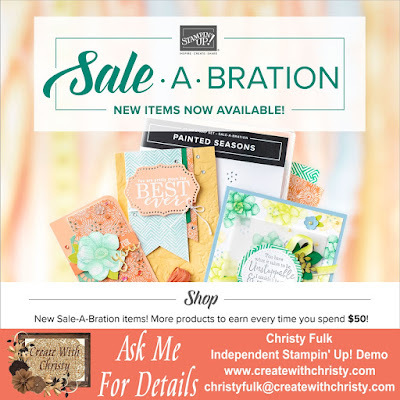 I paired it up with another Sale-A-Bration (SAB) item, Country Floral Dynamic Textured Impressions Embossing Folder (TIEF). This is a Level One SAB item, and you can get it FREE with a $50 order (before shipping & tax). Don't forget, you can only get it free if you place your order by March, 31, 2019...or while supplies last. 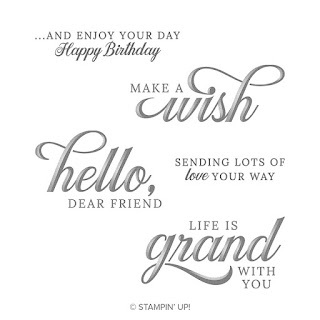 The greeting is one of my favorite greeting stamp sets, Life is Grand. It's from the Occasions Catalog. 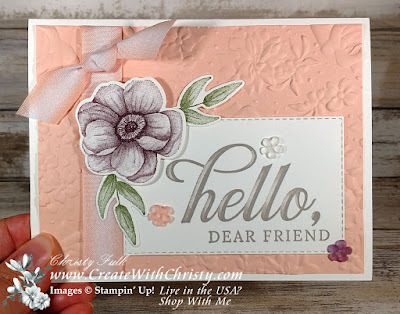 Emboss the Petal Pink piece by running it through the Big Shot with the Country Floral Dynamic Textured Impressions Embossing Folder. Wrap the longer ribbon piece around the left side of the piece, and attach the ribbon ends to the back. With a 8-1/2" side along the top, score the Thick Whisper White piece at 4-1/4" Fold along the score line to form the card base. With the fold on the top, attach the Petal Pink piece to the center of the card base. Tie the smaller ribbon piece onto the top of the attached ribbon using a single knot. Trim the ribbon ends at an angle. Die-cut a rectangle out of the Whisper White greeting piece using the #4 die from the large set of dies (#1 being the smallest) in the Stitched Rectangle Framelits Dies. Stamp the "hello, dear friend" stamp from the Life is Grand Stamp Set onto the bottom right corner of the rectangle using the Gray Granite Classic Stampin' Pad. 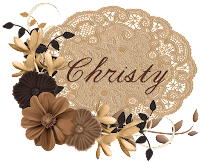 Attach it to the bottom, right of the card, lining the left edge with the ribbon strip. 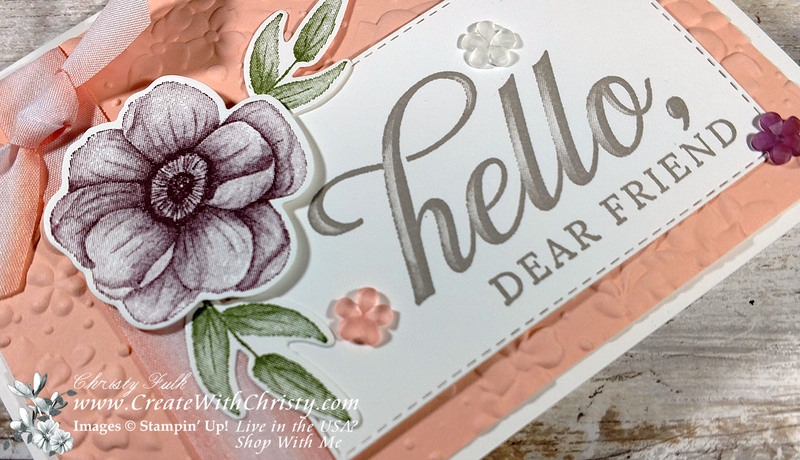 Stamp the flower stamp from the Painted Seasons Stamp Set onto one end of the last Whisper White piece using the Fresh Fig Classic Stampin' Pad. Stamp the leaves trio stamp onto the piece two times using the Mossy Meadow Classic Stampin' Pad. 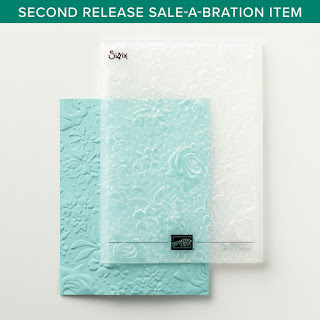 Die-cut the images out with their coordinating dies from the Four Seasons Framelits Dies. 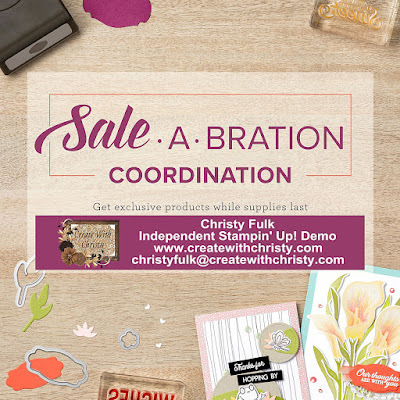 Attach the leaves to the top left and right of the rectangle, and attach the flower to the top, left corner of the rectangle using Stampin' Dimensionals (see picture for placement). Attach three flowers from the Frosted Flower Embellishments (one each color) onto the rectangle (see picture for placement). 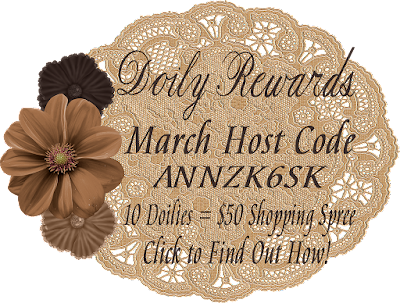 Click on the Doily Rewards Host Code Picture Below to Find Out How.